Hello all! Hope you had a fantastic weekend! Do you hear that sound? 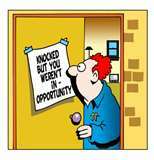 That's the sound of opportunity knocking! Okay, maybe that was a little cliche, but really, are you taking advantage of every opportunity offered to you? I've missed the deadline for a few writing contests, some of them unintentionally, and I can't help but wonder, what if I'd entered that contest? Would they have liked my piece? Would I have won? I'll never know the answer to any of those questions, because I didn't enter. At least with a rejection, you know that you tried. It's important that us writers take advantage of all the opportunities offered to us, especially the free ones. No excuses. Hope everyone has been submitting their work and making the most of all the opportunities. Here's what I found this week. Mason's Road, a literary and arts journal sponsored by Fairfield University, is looking for short stories. One first place winner will win a prize of $1,000 and publication. The theme is: ARC- the rise and fall of dramatic tension within a piece. The entry fee is $15 and I couldn't find the contest closing date, but I'm assuming it's May 1, 2011, since that's when their submission period ends. BOMB Magazine announces it's fifth annual fiction contest. Stories should not exceed 20 pages and must not be previously unpublished. One first place winner will receive a prize of $500. Entry fee is $20 and the contest ends on April 16, 2011. With entry fee comes a one year subscription to the magazine. First place winners in fiction, non-fiction, and poetry will receive a prize of $750, publication, and a year's subscription to Fugue. Second and third place winners will receive publication and a one year subscription. Story and essay submissions shouldn't be more than 10,000 words and poets can submit up to 3 poems or 5 pages. The entry fee is $15, which includes a one year subscription. Contest closes May 1, 2011. The contest is open to submissions of previously unpublished and original novels of 30,000 to 100,000 words that are of high literary quality. The grand prize if 3,000 and publication by Gival Press. Author will also receive 20 copies and a standard contract. Entry fee is $50 and the contest closes on May 30, 2011. The contest is open to short story submissions of 7,500 words or less. First place will receive a prize of $1,000; Second place will receive a prize of $500; and Third place will receive a prize of $250. Winners and finalists will be published in the Fall of 2012 in the anthology, American Fiction: The Best Unpublished Short Stories by Emerging Writers. Entry fee is $12 and the deadline is May 1, 2011. As always, Black Fox Literary Magazine is hosting a fiction contest. We are also accepting flash fiction of any genre and poetry for weekly web features. Happy Writing! Nooo--Quita and I were greedily looking out for those cupcakes. Oh well--probably didn't need them anyway. :) As always, thanks for all of the links!